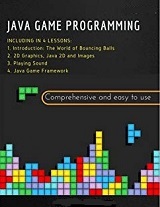 This tutorial teaches you the fundamentals of building a highly illustrative game using the Java programming language. In this book, you'll employ open source software as tools to help you quickly and efficiently build your Java game applications. You'll learn how to utilize vector and bit-wise graphics; create sprites and sprite animations; handle events; process inputs; create and insert multimedia and audio files; and more.